Cut catfish into strips and place into large bowl. 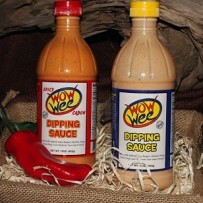 Coat with Wow Wee Dipping Sauce and let marinate for about 10 minutes. Preheat grease to 375. Next coat with Louisiana Fish Fry. Fry fish for about 4 minutes. I have found the best way to drain the grease from the fish is to place a cookie rack in a pan and place the fried fish (or whatever else you are frying) on the cookie rack to drain. Mat has been frying his fish like this for a long time now and I am totally addicted to it.